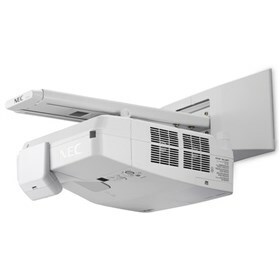 The NEC NP-UM361XI-TM is 3600-lumen 0.63" LCD interactive ultra short throw projector with wall mount, touch module, powerful 20w speaker and ECO Mode™ technology. The projector has comprehensive input/output panel, keystone correction and cornerstone. It features advanced AccuBlend, AutoSense and built-in wall color correction. The NP-UM361XI-TM also features microphone input, closed captioning and remote monitoring. It has variable audio-out, USB viewer and wireless image utility. The new interactive system utilizing dual pens and auto cailbration converts a standard whiteboard into a complete interactive surface for annotation and collaboration locally or via web meetings. The NEC NP-UM361XI-TM has many exciting features for users of all types. See the NEC NP-UM361XI-TM gallery images above for more product views. The NEC NP-UM361XI-TM is sold as a Brand New Unopened Item.